Home > COOLING PRODUCTS > Cooling Vests > TECHKEWL™ Phase Change Cooling Vest With Cooler Bag - Front Zipper - #6626 TOP SELLER! 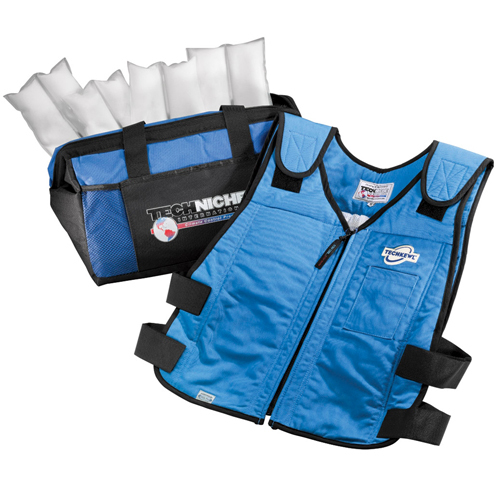 TECHKEWL™ Phase Change Cooling Vest With Cooler Bag - Front Zipper - #6626 TOP SELLER! Stay Cool With TechNiche International’s TechKewl™ Phase Change Vest! It is easy to use and provides up to 3 hours cooling at 58 degrees F. To activate just submerge inserts in cold water or freezer for 20-30 minutes and then place them in vest. Front zipper with height and girth Velcro adjustments. Vest is made of 100% washable cotton. Maintains a comfortable 58 degrees F for up to 3 hours. V-neck w/zipper closure, Hook and loop girth and shoulder adjustments. One set of Cool Pax™ inserts (4) are included with each vest. Safe and easy to use, activate using freezer, refrigerator or ice water. Phase Change Material (PCM) is non-toxic, non-flammable and non-combustible. The TechKewl™ Phase Change Cooling vest is popular with Motorcyclists, HazMat Personnel, Mascots/Costumers, Emergency Response Personnel, Military, Medical Conditions (Ex. Multiple Sclerosis) and others who function in high heat conditions. Vest comes with 1 set of inserts. For continuous cooling purchase an extra set of inserts sold separately. Sizes: M/L (fits 100-175 lbs), L/XL (fits 175-250 lbs), 2X (fits 250-300 lbs). Washing Instructions: Wash by hand with mild detergent. Hang to dry or may be put in dryer on low setting. I have purchased 2 of these and can't express in words how effective this is. QUALITY product made of heavy duty material which stands up extremely well to construction/roofing environments. An extra set of inserts is recommended so you can simply swap them out. In the product info it says, "... up to 3 hours". Realistic time is 2 full hours before the inserts start to loose their effectiveness. This is the single most important cooling product you could buy.